#GE2015 Your Questions Answered #3: What’s Your View on Tactical Voting? First, let’s define our terms. Tactical voting, according to Wikipedia, occurs “when a voter supports a candidate other than his or her sincere preference in order to prevent an undesirable outcome”. This is a relatively simple one for me. You have to separate out the question into two parts to get things clear. There’s the matter of how we should act in our current system, which arguably encourages tactical voting. And there’s the matter of whether we should retain such a system. To me, as a natural Lib Dem supporter, I dislike UKIP to such an extent that I would vote Labour in that environment, as problematic as I find their current attitude to immigration and many other things too numerous to discuss. This would not be true if you replaced “UKIP” with “Conservative” in the question, though. My current constituency is a Tory-Labour marginal and I will be voting Lib Dem on the basis that it’s my sincere preference, and it makes little difference to me which of the two leading candidates win. Another wrinkle is the calibre of the candidates. If I were in Brighton Pavilion, for example, I would be highly likely to vote for Caroline Lucas, the Green Party’s sole MP, as she has improved Parliament by her presence, showing a principled approach and working in a collegiate way with others on various issues. This is also true of Ed Timpson, the Conservative MP for Crewe and Nantwich, who has been to my mind a very good Children’s Minister. It’s not at all simple. But ultimately the point of the secret ballot is to allow you to make such decisions based on your own conscience. 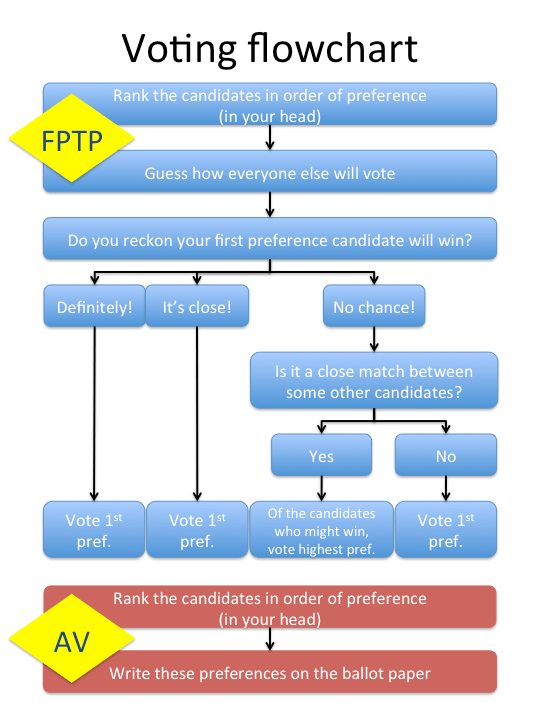 I would tend towards encouraging people to vote for their first preference on that basis, even though the system militates against it. But I would never judge people for voting tactically, given the restrictions placed upon us by the system as it stands. It should be representative. To me this means that the votes cast should translate accurately into the representation elected to enact laws and create policies on our behalf. It should be democratic. To me this means that citizens are able to vote freely and fairly in a system that gives an accurate picture of the people’s wishes. In order for such a system to pertain we would have to switch to a form of proportional representation and a voting system that allows our preferences to be accurately reflected. The Alternative Vote system on which we had a referendum in 2011 would have achieved the latter of the two goals, a substantial improvement and a down-payment on the former goal, which would be the bigger and more vital shift. We may yet see a renewed movement in favour of such reform after the election. Not only will UKIP and the Greens lack almost any representation, despite picking up perhaps 20% of the vote between them; it looks highly likely that we are going to be in a position where the SNP wins perhaps 90-100% of the seats in Scotland on about 45% of the vote.